Hi everyone! We are back from a wonderful trip to the Kruger National Park. I am so far behind on working through images of previous trips, but I have managed to work through some images from this recent trip already since there were quite a few special sightings. I will do a lengthy blog post about an awesome leopard sighting we had soon...but for now, here's an image for you to enjoy. 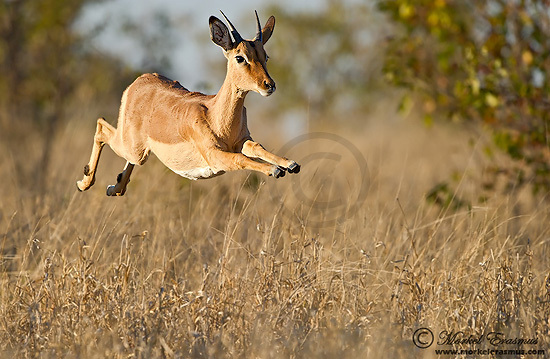 This young impala male was leaping very gracefully at the start of its run, and I was happy to be able to fit him into the frame and also to be at quite a low vantage point relative to the buck's position. See you soon with a more lengthy post! Nice action shot. Speaking of which - I see yiou are happy with the Nikon high ISO. Much has been said about autofocus between the brands. What has been your experience to date - you weren't too shabby with the 7d either! Thanks for your comment, Hermann. The autofocus of the Nikons I own is awesome! I was pretty happy with the 7D, but there's no denying the D3s is in a different league in every aspect (except obviously "pure resolution").